Your eyes are essential to your wellbeing and productivity, so it's important to take great care of them. To that end, you need to find an optical shop that genuinely cares about your needs. At Medford Optical, we truly do, and that is demonstrated in our superb service and family eyewear selection. 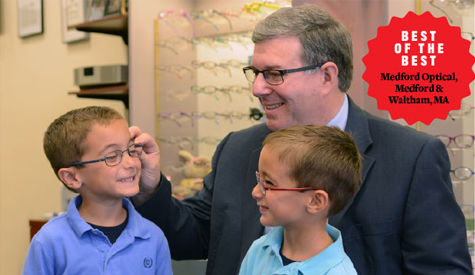 We carry over 1,000 eyeglass frames for the whole family, including the largest selection of children's eyewear in the area. Our full-service shop offers a comprehensive range of eyecare services, including filling prescriptions for specialized eyewear. We have an optometrist on-site at our Medford location, and our professionally trained, licensed, and skilled opticians have extensive experience filling all ranges of eyeglass prescriptions, including unusual ones. Expect our staff to work closely with many area ophthalmologists to meet your needs. With locations in Waltham and Medford, Massachusetts, we're ready to serve you. Contact us today to learn more. Fashion eyewear for your entire family. When a company cares about their work, it shows in everything they do. When you visit Medford Optical, you'll see our commitment to affordable eyewear and service on the faces of our friendly staff members. From owner Dana Cohen to Dr. Adele San Clemente and our manager, Rosanne, our entire team is committed to meeting your optical needs. We treat our customers like family, putting our four decades of experience to work delivering a superb experience from start to finish. Reach out to us today for more information.